Spiral Rope - Bead It! Very fun, not too hard, extremely versatile - we love this stitch! Lots of variations are possible, so we'll leave the choosing of beads until you get here! 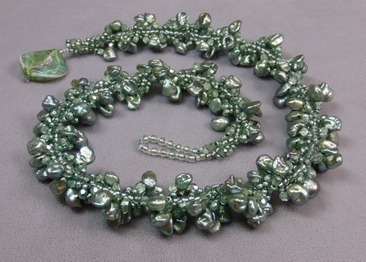 Spiral rope is great with pearls, crystals, or even just seed beads. So, if you've got something in mind, bring it in. Create this luscious lariat with 8/0 and 11/0 seed beads and whatever fun beads you can find for your fringe - Chris used a pair of her mom's old hammered metal earrings at the tips - think outside of the box! With 6/0 seed beads for the core, choose from a variation of beads for your loops - 11/0 seeds with small pearls, crystals, anything goes! If you've done Spiral Rope, you will love Double Spiral! A very cool technique ... we're using both 3mm and 6mm Bugle Beads along with other seed beads. Try it, you'll like it! Using 6/0 seed beads for the core, choose whatever beads you adore for your loops - 11/0 or 15/0 seeds with accents of your choice! Very cool variation to spiral rope! 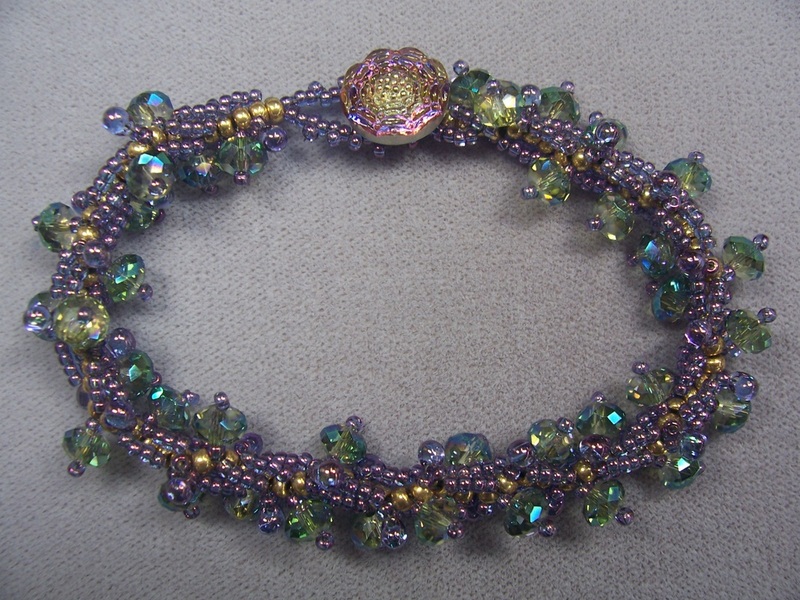 Using 4mm Swarovski pearls and crystals with 11/0 seeds, create either a single or double wide flat spiral. We have used this technique with a wide variety of beads to create very different results - don't be afraid to play! Very cool variation to spiral rope! 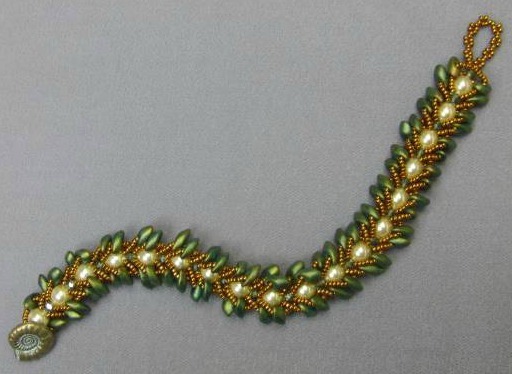 Using 6mm Lentil beads, 3mm round beads and 15/0 seeds, create this flat spiral. We have used this technique with a wide variety of beads to create very different results - don't be afraid to play! Really fun design, we think it very unique! 6mm Bugle Beads, 11/0 and 8/0 seed beads will get you where you want to go with this little beauty. Create it as a bangle as shown, or attach a clasp, your choice! Farfalle adds great texture to this basic spiral rope. Great for beginners, and extremely versatile for advanced beaders. Learn to make this great Spiral Rope, with an extra-added technique to keep the spiral so tight!!! 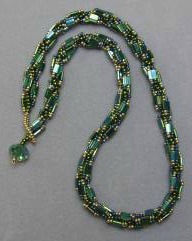 We use 8/0 and 11/0 seed beads with Long Drops. What a gorgeous necklace this makes! We used top-drilled keshi pearls and it is extremely effective, and no harder than any other spiral rope! This is our first class featuring the new Piggy Beads! Just your basic Spiral Rope with a little extra to make the two-hole bead thing work. We have a couple of people making it for friends who think it looks like an octopus! Excellent variation of Spiral Rope with a twist!